USES: When green, plantains are fried for chips or cooked as a starchy stew vegetable. When ripe, they are cooked (usually fried) as a dessert or sweet ingredient in meat dishes or sauces. 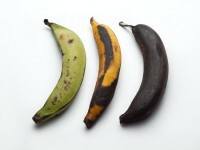 CHOOSING: To use plantains green, choose ones that are firm and have a green tinge to the yellow skin. To use ripe, choose plantains that are fully soft and are nearly completely black–much riper looking than regular bananas. If you buy green plantains, allow about a week for them to ripen. STORING: At room temperature, uncovered, until ripe. Once ripe, in the refrigerator, uncovered for up to a week.